On August 6, 2008, after over three years of work, independent game designer Jonathan Blow launched the puzzle platformer Braid on Xbox Live Arcade. Braid marks an inflection point in Blow's career, his first polished product as an indie; before, he had published only a few sketchy prototypes. He has showcased Braid since 2005, building what became, by indie standards, great buzz. 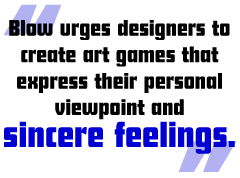 Some players will eagerly assess how the game embodies the artistic principles Blow advocates. In contrast, a few bloggers, stung by his comments about the shady ethics of World of Warcraft, must secretly hope his game bombs. On that count, at least, they're too late. Whether Braid itself succeeds or fails commercially, it had already become famous before launch as a vehicle to highlight Blow's provocative and inspiring ideas. Though he did take three years to create an Xbox Arcade puzzle game, Blow can make things happen. He's been a professional game programmer for over a decade. From 2001 through 2004, he wrote the "Inner Product" technical column for Game Developer magazine. As an example project for the column, he developed a Perl-like scripting language, Lerp. Blow runs the Experimental Gameplay Workshop, held each March at the Game Developers Conference in San Francisco. He participated regularly in the Indie Game Jam. He lectures frequently at conferences worldwide and, as what he calls "a point of principle," posts the audio and slides from his talks on his website or on the Braid blog. There are, as yet, few notable art games. In his lectures, Blow repeatedly cites Rod Humble's The Marriage; Jonathan Mak's Everday Shooter; flOw and Cloud by Jenova Chen and Kellee Santiago; and Jason Rohrer's Gravitation. Blow wants to see a lot more. In his keynote speech "How and Why" at the August 2007 Free Play conference in Melbourne, Australia, he advised aspiring creators to worry less about how to break into the game biz and "just start making things." If you're an artist and can't program, use Flash; if you're a coder, use crude "programmer art." Focus on making (and finishing!) a notable game that comes from a deep motivation. You needn't even innovate, as such. Blow's recent talks hardly mention innovation. Instead, as he said at a GDC rant panel in 2006, "I believe we can make games important, right now, by copying existing games," such as the virtue system in Richard Garriott's Ultima IV. "The problem is, nobody is really trying." Blow also pragmatically notes that a strong personal viewpoint can bring commercial benefits. It helps indie designers gain notice and, incidentally, good publication terms. Everyday Shooter, Flow and Braid, he says, all got good deals on PlayStation Network or Xbox Live Arcade. He asserts (perhaps jokingly, certainly with amusement) that American corporations, being legally enjoined to maximize shareholder value, are therefore technically forbidden to produce personal art games in-house. In that sense, an indie designer has a competitive edge.